Did not know Rafale was out, thanks for letting me know. Great picture of a Canadian 'Rainbow Warrior'. Last week’s federal budget offered relatively modest spending with targeted funding after years of spending from a government that seemed to believe the deficit will solve itself. Unfortunately, the Canadian Armed Forces again escaped the finance minister’s gaze and for the second consecutive year, national defence is conspicuous by its absence from the budget. You might recall the fanfare when Defence Minister Harjit Sajjan released the Liberals’ defence policy review in 2017: “Strong, Secure, Engaged.” It was already more than six months overdue and there was a feeling among defence analysts and most journalists that the Liberals had to deliver a document that suggested serious resolve. But there was one large disclaimer. All of this would happen over the next decade, assuming the realities of 2017 would remain constant during that period. How well would any government have done predicting the military needs of 1942 based on the geopolitics of 1932? Going to be expensive evaluation. To remedy that, I propose sending them this entire 348 page thread. Because at this point I'm confident we've flushed out every detail (and then some) they otherwise would. Boy wonder (if he's still there) can point out how much $ Canada saved, and finally, perhaps someone up there would get that point that the most capable and inexpensive aircraft = winner. Somehow, they keep missing that. I just can't to see this moron being "expelled" from the Federal Government. With "Red" being the Liberal Party (LPC) which is Trudeau's party while "Blue" is the Conservatives. Good chance for F18 decision if the con win I hope. lipovitand wrote: Good chance for F18 decision if the con win I hope. I would say that if the Conservatives win that the bigger chances are for the F-35 (and by far). Remember that when the Conservatives were government that they basically selected the F-35 (without competition). Only after the Liberal government won the election afterwards was when this fighter aircraft procurement "charade" happened (again, in great part due to the Justin Trudeau's election promise to not buy the F-35 and buy a cheaper aircraft, as if that existed in the first place) which resulted in the current Canadian fighter competition. What I was hoping for is once the con win, just scrap the competition, get the F35 and call it a day. We have other things as well that need replacing, like the new camo, ships, vests, and other stuff. I just hate how it takes soo long to make a decision. lipovitand wrote: What I was hoping for is once the con win, just scrap the competition, get the F35 and call it a day. Yes, I agree that would be the best course of action. lipovitand wrote: We have other things as well that need replacing, like the new camo, ships, vests, and other stuff. I just hate how it takes soo long to make a decision. Yes, I agree that there's a lot of stuff that needs to be replaced within the Canadian Forces, including some of what you mentioned above. However I absolutely don't think that cammo is one of them. I don't see anything wrong with CADPAT. Actually the US Marines seem to be extremely happy with it or more precisely with a variation of it, which is MARPAT. ricnunes wrote: I just can't to see this moron being "expelled" from the Federal Government. It looks like the LPC and NDP can form a coalition and win government. That would be the very first time that something like that would happen in Canada. As such I find such scenario unlikely to happen. 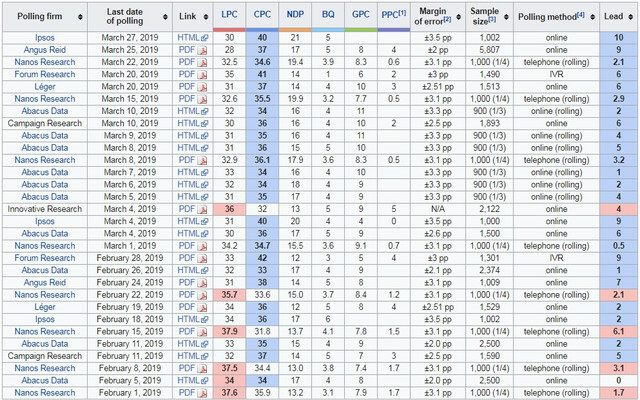 IMO, there are too many diferences between the NDP (basically "Social-Democrats") and the LPC (which despite being often touted as "Left" they are indeed "Center-Right" or resuming, Liberals). But of course, we can never say never.